Okay, all you hot-shot trivia fans out there, here’s one for you. Rules: You’re going to read the question and go think, alright? No peeking. Honor system. What group of musicians played on more number one hits than the Beach Boys, the Rolling Stones, Elvis, and the Beatles combined? There you go. Switch the page, go think. Back? Nope, not Sinatra. Not Michael Jackson. Not even Brittany Spears. The Funk Brothers. Berry Gordy’s floating house band at Motown Records, the hit factory from Detroit, which from 1961 to 1971 charted an amazing 110 Top Ten hits. They were chronicled in a fine 2002 documentary, “Standing in the Shadow of Motown” (promo teaser, opening scene). The Funk Brothers are those guys in the studio who created The Motown Sound – simple but memorable melodies, distinctive chord structures, a thick overdubbed sound (two drums, three or four guitars) a very prominent tambourine to accent the back beat, a melodic line on the electric bass. Orchestral strings, charted horns, finely honed background vocals using a gospel-based call and response. Slick and funky and irresistible. Giddup owyo sea tn daynce! Black music for white kids, drenched in beer and choking on hormones. Berry Gordy found a formula that worked better than Darwin’s and Einstein’s. He made more number one hits than the Beach Boys, the Rolling Stones, Elvis, and the Beatles combined? Think about that. 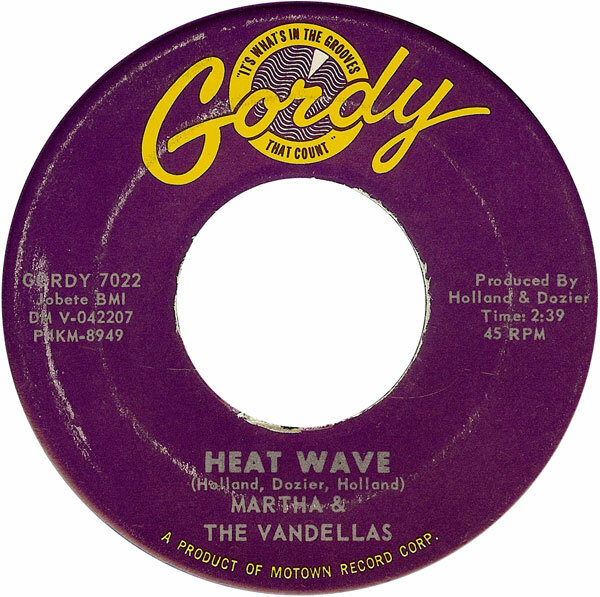 Perhaps the one of those 110 which can be credited with coining that sound, and one of its proudest icons, was Martha and The Vandellas’ ‘(Love is Like a) Heat Wave’, which we’re more than tickled to bring you as our Song of The Week. 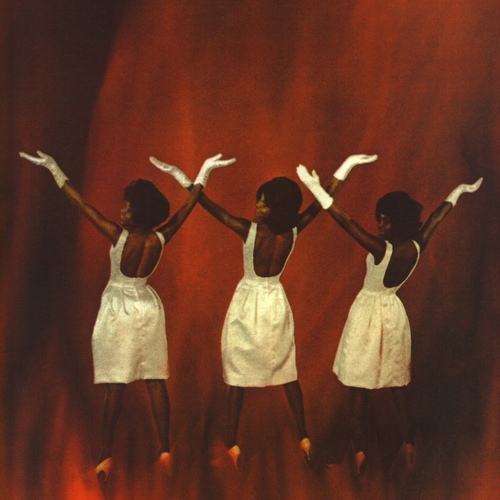 Martha Reeves (1941–) was born in Alabama and raised in Detroit (ever hear that one before?). She formed some teen groups, trying to break into the professional soul scene in Detroit. She showed up on the wrong day for an audition at the offices of the fledgling Motown, and walked out with a job as a secretary. She and her old (15 year-old) singing girlfriends Rosalind Ashford and Annette Beard (later Betty Kelly) eventually got their chance to sing, and provided stunning backup vocals for a new Motown singer on what became his first hit, “Stubborn Kinda Fellow“. I still remember that 45 with the tiny lettering under Marvin Gaye’s name, “Backing Vocals by The Vandellas”. That’s what I spent my teenage years reading. 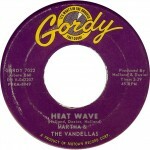 Martha and the girls (Vandella is a combination of Detroit landmarks Van Dyke Street and soul singer Della Reese) got thei r chance to record in 1963. Their second single was the first recording by Holland-Dozier-Holland, the team responsible for writing and producing most of those 110 Top Ten hits. “Come and Get These Memories” hit #29 on the white chart, #6 on the black chart (yes, Virginia, there were segregated hit lists in those days). Here’s the original, and here’s a knockout live version from the Apollo Theatre, 1963. 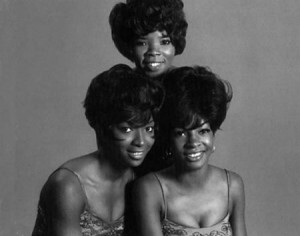 Check out The Vandellas’ moves. Oh, my my my. And then in mid-1963 came their second hit, the divine, feverish, unforgettable ‘(Love is Like a) Heat Wave’, #4 on the white chart, #1 on the black one. It’s worth hearing over and over. And over and over. Here’s a great video of them lip-syncing to the original. For the obsessives out there (and in here), here’s The Funk Brothers’ instrumental track. And here’s the girls’ naked vocals, a cappella. The Funk Brothers achieved a riff so fine here that they repeat it a second time in the introduction. How the hell did they do it? So simple, so fine. They have the piano, the bass and an alto sax all playing the same progression, powered by some manic drums. The timbre of the girls’ voices is as dark as the deepest jungle, the very heart of darkness. The song is using all kinds of church-inspired allusions (‘Could it be the devil in me’, the call-and-response, the hand-jive in the video), but the subject is what’s going on in the alley behind the church. The very visceral concerns of a young girl overwhelmed by the outburst of the new, unfamiliar sexual desire, literally consumed by the fire of passion for her (very lucky) paramour. Starts to burning and I’m filled with desire. Could it be the devil in me, or is this the way love’s supposed to be? It’s like a heat wave burning in my heart. I can’t keep form crying, it’s tearing me apart. Sometimes I stare in space tears all over my face. I cant explain it, don’t understand it, I ain’t never felt like this before. Don’t pass up this chance, it sounds like a new romance, its like a heat wave!! And the song was so successful that it inspired a couple of more natural disaster ghetto-inflamed follow-ups for Martha and The Vandellas, ‘Quicksand’, ‘Livewire’, and then ‘In My Lonely Room’. Then in 1964 came ghetto anthem ‘Dancing in the Streets’, one of the most-played singles ever, followed by a few more memorable hits, notably the dark ‘Nowhere To Run’ and the lighter ‘Jimmy Mack’. The song has of course been covered, most memorably by Linda Ronstadt, here at her most fetching in a live version. It’s not too often that The Who come off as pale li’l white boys, but no one can match that Motown magic. 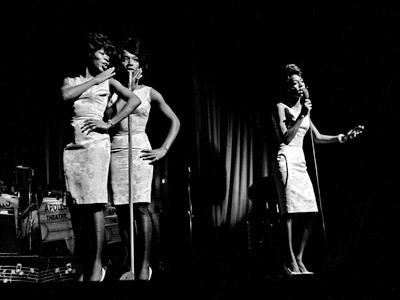 And if you think that Martha and the Vandellas are ‘just another girl group’, here are a couple of fascinating disproofs: The Supremes’ very insipid cover of ‘Heat Wave’, and a really neat live duet between Martha and Dusty Springfield on ‘Wishing and Hoping‘. I’ve heard ‘Heat Wave’ thousands of times, from my little plastic AM radio, through testosterone-drenched fraternity beer-bashes, to the most cerebral psychedelic playlists. And it never fails to get my blood pumping, even in these hardening arteries today. Every single time. Over and over, from right to left and upside down and inside out. Those ‘Yeah! Yeah!’ shouts at the end – how do you describe this music? Infectious? Febrile? Frenzied? Oh, why bother? An adolescent girl who has the hots so bad that her temperature actually rises? What a silly concept! But you know what? 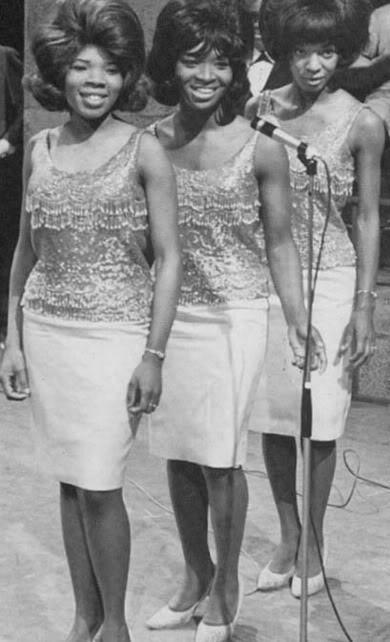 When Martha and the Vandellas sing it, I believe them. The documentary film about the Funk Brothers – “Standing in the Shadows of Motown” is worth seeing. This reminds me of all those millions of articles that say that Castro outlived x number of presidents without mentioning that they could only serve 2 terms and had to be elected to office in the first place. Berry Gordy as a performer did not do what you said he did. You’re comparing apples to oranges. You’re a smart guy. You don’t have to do that. “You’re a smart guy. You don’t have to do that.” I would cut that out now but there is no edit function. There’s a video of this interview on YouTube but I can’t find it right now. As a young lad I cherished my Motown/Tamla/Gordy/Soul 45s. (Still do!) Such incredibly wonderful music. For anyone interested…check out the Cellarful of Motown collections (2 CD sets of 4 volumes) with tracks uncovered from the vaults. Tons of tracks that could’ve been all over the AM dials if they were released (and there was room on the charts considering all the other Motown tracks on them at the time.) And although I love “Heatwave”, my favorite single track of all time would be “Dancing in the Street”. Incredible to this day. Martha sirens over a driving beat, encouraging folks across the nation to dance (perhaps instead of rioting??). It has this looming quality about it and I swear that the Stones “Street Fighting Man” is their albeit great attempt to recreate that Vandellas classic track. 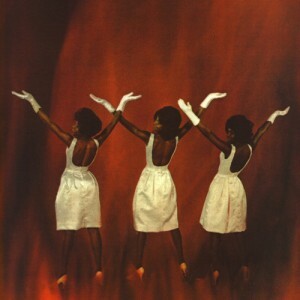 There is an extended version of “Dancing…” on the new Martha and the Vandellas’ 50th Anniversary collection (which includes a whole disk of unreleased tracks) which is a treat for those who grew up with the single version. All in all my vote for one of the greatest rock and roll songs ever. But that’s just me. Check out the Anniversary collection. GREAT sound and all the tracks on there. Are you ready for a brand new beat? And as always thanks Jeff for the conversation! !